Nick Leeson is candid about his central role in one of the biggest financial scandals in history. It’s taken him 20 years to partially rebuild a shredded reputation but he admitted he will always be tarnished by that “embarrassing” period between 1992 and 1995. “I completely went off the rails and was rightly punished,” he said. A high-flyer for Barings Bank in Singapore, the working-class boy from Watford, England, initially made the company millions before attempting to cover up a colleague’s mistake by putting $34,000 in an error account. The former derivatives broker then proceeded to make fraudulent and unauthorized moves which, by the end of 1994, left him $339 million in the red. The risk-taking peaked in January 1995 when the then 28-year-old’s huge gamble on the Japanese stocks backfired after an earthquake struck overnight sending Asian markets into a panic. 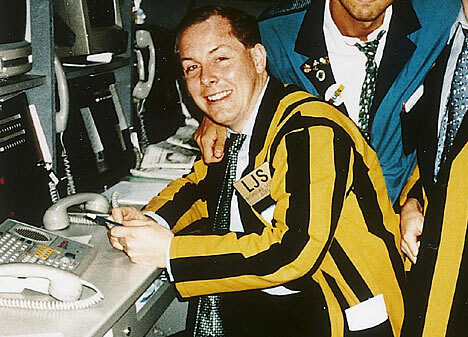 Leeson’s ego-fuelled actions single-handedly brought down Barings, with losses eventually totalling $1.4 billion. He went on the run for nine months before being sentenced to six-and-a-half years in a Singapore prison for fraud. Leeson, now 51, was released two years shy of that after being diagnosed with colon cancer. The man dubbed the “original rogue trader” has pieced himself together since then, beating illness, writing a book, which was turned into a film starring Ewan McGregor, and establishing himself as a well-regarded speaker at conferences and dinners. He’s done some work with Ivey Business School students and even dabbled in reality TV, gaining unlikely fans in this month’s UK Celebrity Big Brother. He accepts, though, that he will always be known for destroying Barings, a 233-years-old institution, and is honest about his reckless behaviour, conceding that by the end of 1994 he had lost all control. He said: “One of the problems that was happening at Barings and maybe a few other institutions was that wrongdoing wasn’t necessarily punished, so putting something into an error account for a couple of days was something you used to see quite often. Leeson kept searching for positive signs that he could turn things around and buy himself time to recover the losses. The markets, however, just wouldn’t co-operate. He said: “If you look at it chronologically, and I know the numbers are big and they are big from the beginning, it was probably wasn’t until the end of 1994 that I had given up hope. The markets were falling with extra selling pressure coming in and he admits there simply wasn’t the size or depth to get out of the mess he had created. The Eureka moment, he admits, was never going to arrive but still he couldn’t face failure. Leeson flew back to London with no intention of returning but said the simple “stupid reason” he went back was because his wife wanted to show off their lavish Asian lifestyle to friends. In early 1995, he embarked on “some excessive risk taking” that finally exposed his fraud. Leeson learnt his lesson on the biggest scale possible but he said the warning signs apply to any wealth professional. He told advisors and traders in Canada that communication and learning to take a loss are fundamental skills. He said: “It’s all about your risk management, making sure you co-operate within the controls and restrictions that are there and are disciplined about what you do. “One of the other things about financial markets is people don’t want to accept failure. Taking a loss is the hardest thing human beings have to do. It's something that is essential obviously in the financial markets but it goes against human nature. As a former trader who thought he could never lose, Leeson expressed concern that retail investors in Canada are being fed lies to lure them into the markets. He believes there is already a movement back towards professional money managers. He said: “[Advertisers] stick up a picture of themselves with a Ferrari they’ve rented for the weekend and it gives the illusion they’ve made a load of money trading futures or spread betting or trading CFDs. “It lures a lot of people in and 90-95% of them lose the money that they are investing really, really quickly. So a move back to the more traditional forms of investment is very much needed where professionals look after people’s money. Nick Leeson features in episode one of CMC Markets Canada’s The Artful Trader podcast second series.